Manigault said she was “haunted” by President Donald Trump’s tweets. 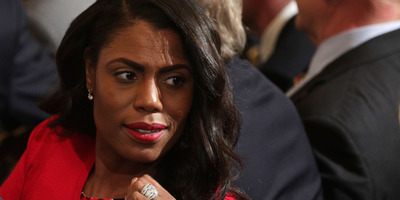 “Omarosa was fired three times on ‘The Apprentice,’ and this is the fourth time we let her go,” White House deputy press secretary Raj Shah told reporters. Manigault was actually fired twice from Trump’s signature NBC show. Her comments to a fellow cast member on the CBS reality show caught attention Thursday. Manigault said she “tried” to help keep Trump in check, only to be “attacked” by other aides. Q: Should we be worried? Manigault, who served as communications director for the Office of Public Liaison, departed the White House in December –and the exit was ugly. Some reports said Manigault was physically removed from the White House, while others said she resigned from the position. Soon after her exit, she told ABC’s “Good Morning America” that she saw plenty of things that “upset” her while serving the president. “There were a lot of things that I observed during the last year that I was very unhappy with, that I was very uncomfortable with,” she said.